Den nya Silver bommen har numera världens lättaste frontbeslag, iFront 2.0. Bommen är tillverkad i 7075 alu-kvalitet vilket innebär att du får en betydligt lättare och 30% styvare bom än med standard aluminium. The focus is on our four brand new sails and a complete package of hardware components, these are the best and most advanced rig accessories we've ever made. This is the evidence that NorthSails is not only the no.1 in sails but also the only true rig brand on the market. done. This way development or even innovation is out of the question. This is a real shame! Specifically designed components offer so much development potential - not only in terms of comfort, but as well in performance and durability. We already recognized this over 30 years ago back when we were the first sail brand developing our own booms. We are still shaping the future of windsurfing and promoting the sport so together with the team our engineers and technicians have spenteven more time on the new rig components. With some amazing results. The technical masterpiece which makes all NorthSails booms even more functional: iFRONT 2.0 the latest new and improved in all aspects headpiece of the next generation. The STREAMLINER.DESIGN has aerodynamic as well as weight-oriented advantages. It doesn’t just look slimmer and smoother, the iFRONT 2.0 is also a whopping 35% lighter than its predecessor! With 345 grams it is the lightest front-end on the market! 90% of all other booms on the market are equipped with the same front-end from China, which usually differs only in color or design details. Especially in major components we at NorthSails are investing heavily in research and development to be far ahead of the competition. A prime example of this is the completely redesigned and absolutely unique iFRONT 2.0 front-end; it combines maximum ease of use with highest functionality, low weight and guaranteed durability. 1 The performance-oriented design (NeilPryde, NorthSails iFRONT 1.0). These are uncompromisingly rigid front-ends in ALL directions, offering maximum vertical (torsional) stiffness. This leads to an extremely direct connection / transmission of boom to mast (= maximum performance). Whilst this construction offers no horizontal flex which is where the performance aspects come into play the adaptation to different mast diameters is possible only via a V-geometry of the collar. This can lead to point loading of the mast, which increases the risk of slipping and also mast breakage. 2 The "cuddly" construction (Aeron and all OEM versions that are used on 90% of all booms). This front-end flexes in ALL directions and the soft sidewalls of the collar adapt to any mast diameter. This protects the mast and avoids slippage. The disadvantage is that the soft sidewalls offer just a very low vertical (torsional) stiffness = low performance. A Unlike other front-ends, the extra-long stainless steel axle-bolts are directly connected to the side walls. Thus we obtain a maximum vertical stiffness, which results in an extremely direct connection/transmission of boom to mast (= maximum performance). B The partially recessed center of the collar gives the iFRONT 2.0 a kind of hinge function, so that the collar fits to any mast diameter without any gap (= very smooth on the mast and extremely slip resistant). We know of no other front-end that fits so smoothly around the mast and thus effectively protects the mast. This exceptional fit is guaranteed on SDM as well as RDM masts as the iFRONT 2.0 can be adapted within seconds through the exchange of 2 different friction pads. - Stiffness I with 15% vertical flexibility has a very low flex for direct power transmission yet maximum control and comes with all RED, SILVER, as well as GOLD and PLATINUM (up to 170) booms. - Stiffness III with 0% vertical flexibility for uncompromizing torsion-stiffness and maximum performance on large sails comes with all GOLD and PLATINUM (190 and up) booms. Of course, we remain true to our promise of long-term compatibility even with the iFRONT 2.0. Therefore it is 100% retro-compatible with older NorthSails booms that can be upgraded and tuned. The high-density EVA grip insert at the outside guarantes maximum abrasion resistance during rigging. Also the short booms now feature a 4 cm wider tail-end moving your back-hand further away from the sail. For the first time now your back- and front-hand are equally angled making sailing less fatigue. You immediately realize this much more relaxed sailing position no matter if going in a straight line or down the line on a wave. The second advantage is a much improved handling during ducking maneuvers. Especially on carbon booms most brands integrate the fittings into the tail-end to generate a clean look. 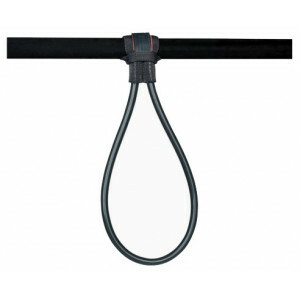 A No more rope twist - this guarantees an ideal 100% frictionless alignment of the rope! B Instead of tying the excess rope around the tube you just wrap it around the integrated "bridge" at the bottom side - the cleanest and fastest solution ever!